FORT BRAGG, N.C. — After three deployments to Iraq and three to Afghanistan, Staff Sgt. Dennis Swols is agitated, prone to bouts of anger and unable to really talk about his time on the battlefield. But as Swols sits in a small office in the Robinson Health Clinic at Fort Bragg, his hand drops to the furry head beside him and his mood brightens. Settled at his feet, Lexy, a 5-year-old German shepherd, gives Swols a few moments of distraction. It’s her job. And, according to Swols, she’s good at it. For 82nd Airborne psychiatrist Maj. Christine Rumayor, Lexy is a partner, a conversation starter and a living, breathing medical tool that can calm a patient and make a therapy appointment a little more enjoyable. A slowly evolving form of treatment, animal therapy is used in only a few other Army installations, including Walter Reed National Military Medical Center in Bethesda, Maryland. A small number of dogs like Lexy are being used almost as co-therapists. Others routinely work as service animals and are often used for animal-assisted therapy, including in visits to patients in the hospitals. Lexy’s move into therapy was unexpected. Rumayor decided to put her new puppy through the training when she realized Lexy was less of a guard dog and more of a calm cuddler. 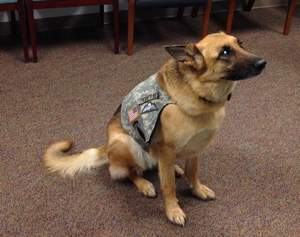 So, Lexy went through about 2½ years of training before she was able to pin on her rank — she’s a lieutenant colonel — and become certified as Fort Bragg’s only therapy dog. As the Army struggles to address the broad swath of stress disorders and mental health problems brought on by more than a decade of war, one of the biggest hurdles is getting soldiers to put aside the bravado and seek treatment. Lexy, it turns out, is particularly good at that. 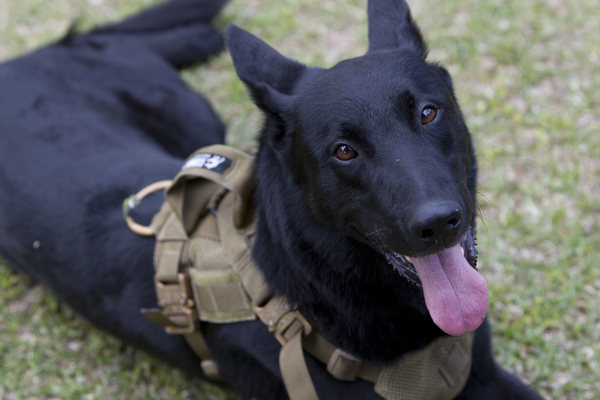 [caption id="" align="alignnone" width="720.0"] Munion is a MARSOC Critical Skills Operators Service Dog donated by Svallin. Van Woodruff, who was a sergeant first class, went to his scheduled appointment just a few days before he was set to get his medical retirement and move out of the Army after 13 years in the service. Rumayor, who wrote the Fort Bragg policy that allows her to use Lexy in her practice, said there was resistance at first. “You don't want everybody to think they can just bring their dog to work,” she said. Rumayor also has seen what an asset the dog can be in getting soldiers to seek out therapy and consistently attend their appointments. Walking around the base, she uses Lexy as a lightning rod to attract soldiers, then draws them into conversation. On any given day, she and Lexy will wander over to the motor pool or anywhere troops might gather, to see who might be interested in having a chat. And often the soldiers reward her. On her vest, Lexy sports an Army Ranger tab and a spray of other badges and patches that she got from patients. The special forces tab came from a soldier who had been injured in a roadside bomb blast, and Lexy and Rumayor visited him in the hospital. 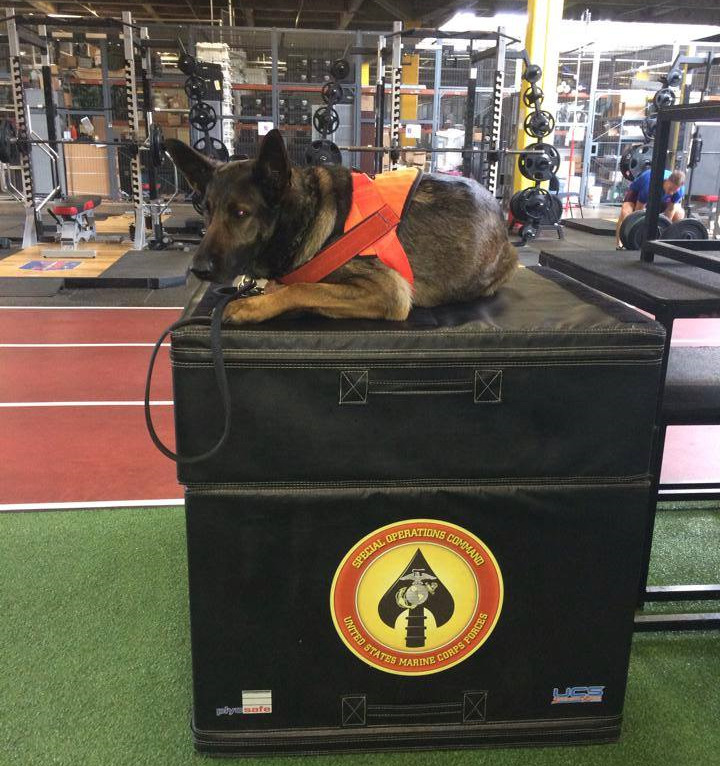 [caption id="" align="alignnone" width="600.0"] Jop a retired service animal donated to The Raider Project. Jop now supports a Critical Skills Operator at MARSOC. Navy Capt. Robert Koffman, the senior consultant for behavioral health at the National Intrepid Center of Excellence in Bethesda, has a therapy dog of his own, named Ron. And he’s seen the broad impact the dogs can have. Ron, a 3-year-old golden retriever/labrador mix, holds the rank of a one-star general and his designated military occupation is a “psych tech.” He’s even trained to bring tissues to distressed patients and put his head on a person’s lap if he or she is stressed. Lt. Col. Matthew St. Laurent, who is the occupational therapy chief at Walter Reed, said the use of dogs to aid therapy has been endorsed by U.S. Army Medical Command and appears to be getting more support across the military. Both he and Koffman said additional research is needed to determine how and when it is best to use the animals.